Abnormalities of the lumbar nerve tract caused by congenital variations or high nerve root take-off angles are difficult to visualize. Diffusion-weighted magnetic resonance neurography (DW-MRN) has recently been introduced for imaging of the lumbosacral region. The aims of this study were to identify lumbar nerve tract abnormalities caused by congenital variation or a high nerve root take-off angle using DW-MRN and to assess the diagnostic value of this imaging modality. A total of 573 magnetic resonance images from 575 patients (261 men, 314 women; mean age 58.5 years) with low back/leg pain were retrospectively analyzed. 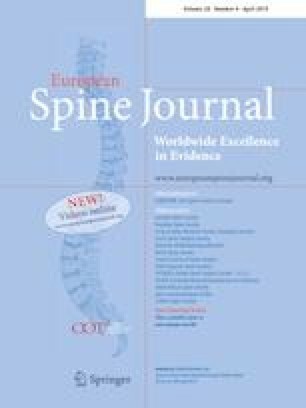 We classified congenital variations in the lumbar nerve roots using the Neidre and MacNab criteria and investigated nerve roots with a take-off angle of 60° or more. Congenital variations were identified in 8 patients (9 nerve roots, 1.6%). The most commonly identified variation was in the sacral nerve root (n = 5) followed by the L4 (n = 3) and L5 (n = 1) nerve roots. All variations identified were on the left side. There were 3 cases of type 1a variation, 1 of type 1b, 1 of type 2, and 4 of type 3. In total, 210 (36.6%) of the magnetic resonance images showed high nerve root take-off angles at the intervertebral foramen that was caused by disk herniation, spondylolisthesis, or osteophytes with degeneration. Patients with high nerve root take-off angles were significantly older than those without (P < 0.05). The online version of this article ( https://doi.org/10.1007/s00586-018-05867-1) contains supplementary material, which is available to authorized users.